The Ku band (Kurtz-under band) is primarily used for satellite communications, particularly for editing and broadcasting satellite television. This band is split into multiple segments broken down into geographical regions, as the ITU (International Telecommunication Union) determines. The Ku band is a portion of the electromagnetic spectrum in the microwave range of frequencies ranging from 11.7 to 12.7GHz. (downlink frequencies) and 14 to 14.5GHz (uplink frequencies). 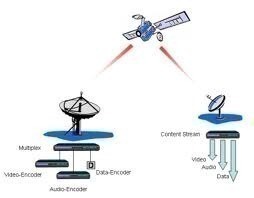 The most common Ku band digital reception format is DVB (main profile video format) vs the studio profile digital video format or the full-blown Digicipher II 4DTV format. The first commercial television network to extensively utilize the Ku Band for most of its affiliate feeds was NBC, back in 1983. The ITU Region 2 segments covering the majority of the Americas are between 11.7 and 12.2 GHz, with over 21 FSS North American Ku-band satellites currently orbiting. Each requires a 0.8-m to 1.5-m antenna and carries twelve to twenty four transponders, of which 20 to 120 watts are consumed (per transponder) for clear reception. The 12.2 to 12.7 GHz segment of the Ku Band spectrum is allocated to the broadcasting satellite service (BSS). 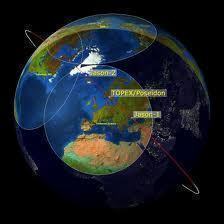 These direct broadcast satellites typically carry 16 to 32 transponders. Each provides 27 MHz in bandwidth and consumes 100 to 240 watts each, accommodating receiver antennas down to 450 mm (18 inches ). The ITU Region 1 segments of the Ku spectrum represent Africa and Europe. (11.45 to 11.7 GHz band range and 12.5 to 12.75 GHz band range are reserved for the fixed satellite service (FSS), with the uplink frequency ranging between 14.0 and 14.5 GHz). When frequencies higher than 10 GHz are transmitted and received in a heavy rain fall area, a noticeable degradation occurs, due to the problems caused by and proportional to the amount of rain fall (commonly known as known as “rain fade”). This problem can be combated, however, by deploying an appropriate link budget strategy when designing the satellite network and allocating a higher power consumption to overcome rain fade loss. In terms of end-viewer TV reception, it takes heavy rainfalls in excess of 100 mm per hour to have a noticeable effect. The Ku band’s higher frequency spectrum is particularly susceptible to signal degradation, considerably more so than C band satellite frequency spectrum, though the Ku band is less vulnerable to rain fade than the Ka band frequency spectrum. A similar phenomena called “snow fade” (when snow accumulation significantly alters the dish’s focal point) can also occur during Winter Season. The Ku band downlink uses frequencies between 11.7 and 12.7GHz. Services that can be found on the Ku-band include educational networks, business networks, sports backhauls, tele-conferences, mobile news truck feeds, international programming, various SCPC (Single Channel Per Carrier) transmissions of analog audio, as well as FM audio services. If the user already has an operational C-band system in place, he/she can retrofit it to accept Ku band frequencies. In order to do so, users need to obtain a Ku-band LNB, a C/Ku band feed-hon, plus some coax cable for the Ku-band LNB. As for the coax cable recommended, RG-6 is optimal for low loss in the 950-1450 frequency range, which is what Ku-band LNB processes. However, if RG-59 is the only viable option, it will work in a pinch. If the user has a solid dish, he/she should have no problem converting from C band to Ku band. However, with a mesh dish, if the “holes” in the mesh are greater than a quarter inch, the chances of computability are not in the user’s favor due to the fact that his/her dish will not reflect Ku-band signals properly. Therefore, the user should strongly consider upgrading to either a solid dish or a mesh dish in which the hole size is under 1/4.” Ideally, the dish should be 1 piece (or at least very few pieces). A 4 section dish is more optimal than an 8 section dish. The fewer the sections, the more accurate the parabola shape is and the more difficult it is for the dish to become warped (the smaller the number of seams the better). As far as dish mounts go, the H2H (Horizon-to-Horizon) dish mount is more desirable than a polar mount. This is due to the fact that the Ku-band demands that the dish antenna system is well targeted and able to closely follow the orbital arc, which the H2H mount does quite admirably when compared to a polar mount. Also, bear in mind that the user will be adjusting both the azimuth and elevation, which can be a bit tricky occasionally. The dish’s parabolic shape is of critical importance as warpage causes signal degradation via mis-reflection, seriously down grading overall system performance. Some tape and string is all that is required to do a quick warpage check. Anchor a piece of string that is stretched as tight as possible, “north” to “south” across the dish face and edge to edge. Do the same thing again with another piece of string, only “east” to “west” across the dish face at 90 degree angles. Make sure that both strings are tight. If the strings come together anywhere but the direct center, the dish has sustained warp damage and needs to be bent back into proper parabola shape for optimal performance. If they connect in the center of the dish, it is likely that the dish is not warped. 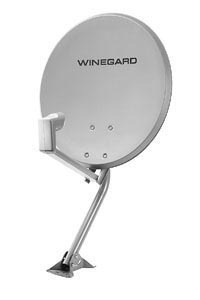 Therefore, use either the tri-supports or quad supports as they will greatly assist in keeping the Ku-band feed horn highly stable, even in high winds. When the button hook feed moves in the wind, Ku-band reception can easily drop out. By putting guy wires on the button hook feed, the user will create the much needed support in the event that the user is unable to obtain a tri support or quad support. don’t have ku band video signal anymore…did they shoot down? Thank you for your helpful article. I have a question; you mentioned :”the Ku band satellites typically require considerably more power to transmit than the C band satellites”, the question is, isn’t it a merit? I mean considering the same size of dish, a ku band apparatus is able to receive higher amount of information; the received signal has a higher power, therefore it is intenser. Please guide me. More power means higher cost… and every part of a satellite is extremely expensive. More power doesn’t mean more information, it just means more power. how are you. I am arafat from bangladesh. i have downlink frequency (3790), satellite apstar 2R. i want to know how i calculate uplink frequency from downlink frequency (total procedure). thank you. add 2225 to 3790 and that would be 6015 MHz it is uplink freq. 276 queries in 0.332 seconds.